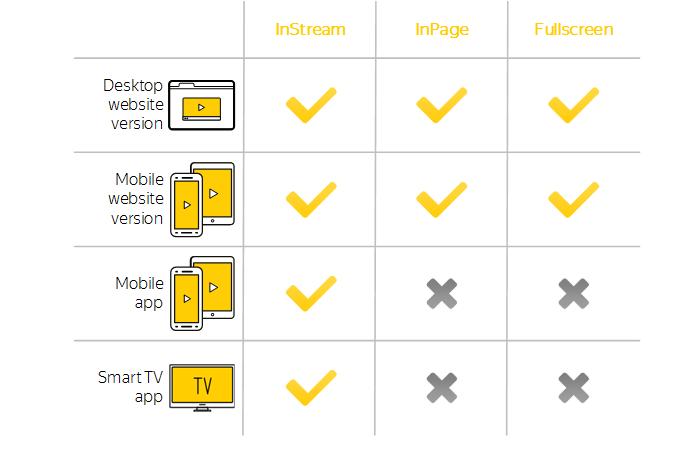 InStream — advertising in linear video content; such advertising is displayed in a video player. The ad may be displayed before (pre-roll), after (post-roll) and during (mid-roll) the main video or when the user clicks "Pause" (pause-roll). InPage — videos displayed directly on website pages. Fullscreen — a full-screen video displayed over the main website content. In addition, Yandex Advertising Network's participating video resources may receive additional placement spaces on Yandex.Video pages. More details.